Whereas structural properties of suspensions of hard spheres of diameter σ are well approximated by analytic expressions, it is necessary to use numerical solutions of integral equations to calculate these properties when the pair potentials have a soft part. The finite range of repulsive pair potentials gives rise to a correlation hole, meaning that the pair correlation function g(r) is essentially equal to zero up to a well-defined nearestneighbour separation larger than σ. 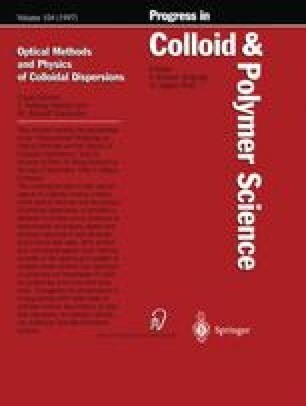 The aim of this work is to show that because of the correlation hole various dynamic properties of chargestabilized suspensions are qualitatively different from those of hard spheres. It will be argued that the observed non-linear volume fraction dependencies of the shorttime self-diffusion coefficients and of the sedimentation velocity can be understood in terms of a model of effective hard spheres with diameter σ EHS which depends on the volume fraction. Moreover, the long-ranged electrostatic repulsion gives rise to an unexpected enhancement of the longtime self-diffusion coefficient due to hydrodynamic interactions, in contrast to what is known for hard spheres. This enhancement is also understood in terms of an effective hard sphere model.